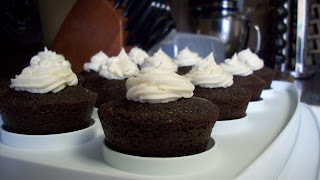 I finally made the Irish Car Bomb cupcakes (or Guinness and Bailey's Irish Cream Cupcakes to be PC) from Annie's Eats for tailgating yesterday. So good - I only made a half batch since we only had 6 people but I probably wouldnt have had leftovers if I had made the full batch. Definitely a recipe I'll be making again in the future. The recipe below has my slight adaptations. Preheat oven to 350 degrees and prepare muffin pans by either lining with paper liners or buttering and flouring each cup. Combine beer and butter in a saucepan over medium heat and cook until melted, whisk in the cocoa powder until smooth and remove from heat. Let cool for a few minutes so you dont cook your eggs when you add it to the mix. In a mixing bowl, combine eggs and sour cream and beat until well combined. Add beer mixture and beat just until combined. Mix in the flour, sugar, soda and salt on low speed just until combined. 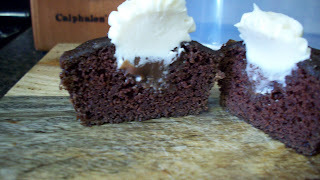 Pour into muffin tins, filling each cup about 2/3 of the way full. (I like to add my batter to a large ziploc bag and snip off the corner and pipe into the muffin tins to make the process easier and less messy.) Bake about 15-17 minutes until a toothpick inserted in the center comes out clean. After cooling about 10 minutes, remove from muffin tins and cool completely on a wire rack. Cream butter in a mixing bowl for 2-3 minutes until creamy and smooth. Add Bailey's and mix in sugar and meringue powder just until smooth, adding milk as necessary. (You can add all Bailey's if you prefer but I thought the flavor was plenty strong with a mix.) Pipe on frosting as desired.